Dave is an active police officer with the Berea, Ohio police department where he has served since 1982. In addition to being a patrol officer, he was a Field Training Office and developed the program now being used by the department. He was with the SWAT team, the Southwest Enforcement Bureau, as a marksman. He has been a Range Officer for over 30 years. He is an Ohio Peace Office Training Program instructor, which includes range training and numerous other police training areas. He is also an NRA certified instructor for Home Protection and Basic Pistol. Dave owns and operates 1st Defense Personal Protection Service. 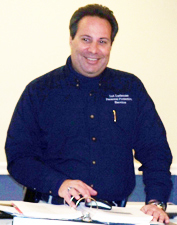 He specializes in personal protection and conducts Concealed Carry Permit classes and Advanced Shooting classes. Since 1994, Dave has taught at Polaris Joint Vocational School in the Criminal Justice division and imparts his wisdom with students interested in pursuing a career in law enforcement. He holds holds a long-term license with the State of Ohio Department of Education. Dave is a contract guard with the United States Marshals Service and was responsible for court security and prisoner care and transportation. Dave is also the Vice President of the Gun Owners Legal Defense Network (GOLD'N), a non-profit corporation that offers legal representation to gun owners all across America. GOLD'N maintains their corporate offices in Berea, Ohio, and utilizes their classroom to host Dave's firearms training classes. With his many areas of expertise, Dave brings valuable knowledge to his operation and he continues to be a valuable asset to each one of his endeavors..